← Day 46: Volunteer for Slow Food. Oprah! No other name can instantaneously command so much nurturing and respect, not to mention amass an incredibly large gathering of women with minimal advertising quite the way she does. 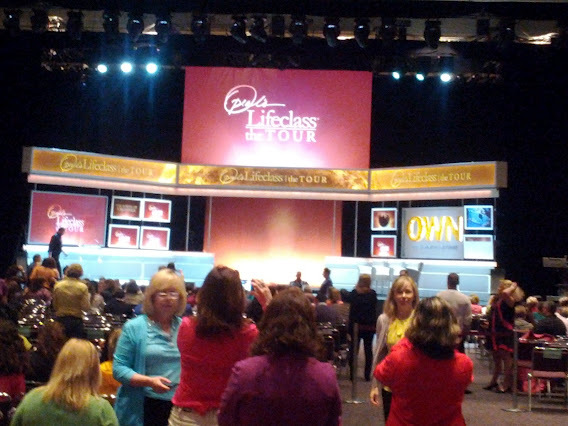 Today, I attended Oprah’s Lifeclass Tour, which also happened to be the first ever taping of her show in Canada. In fact, she held two marathon sessions, back to back: one focused on Gratitude, the other on Forgiveness. 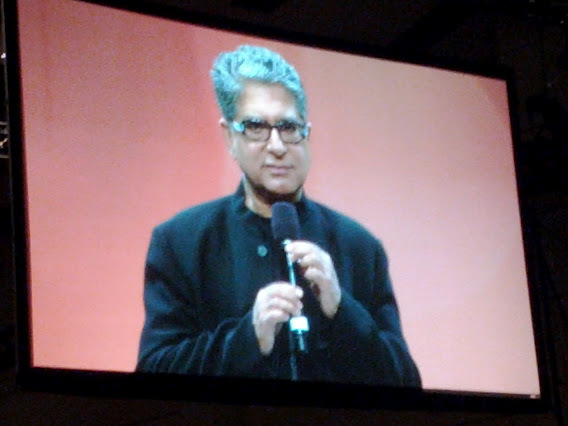 For both of them, she was flanked by her panelist of renowned self-help gurus: Deepak Chopra, Iyanla Vanzant, Bishop T.D. 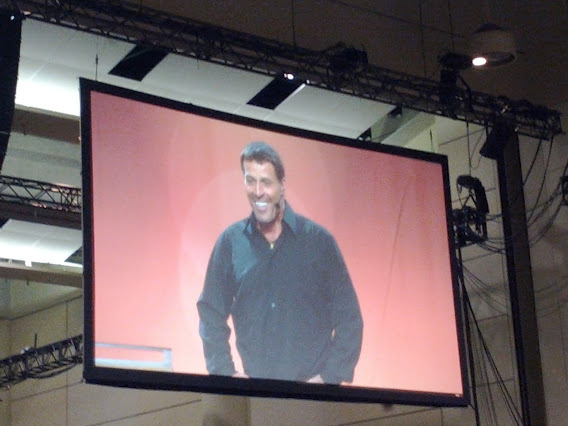 Jakes, and Tony Robbins. In a word? Opportunity! But first, a few news flashes for you, in case you had forgotten: we are all going to die, so you may as well make the most of the time you have. Today is the first day of the rest of your life. You can choose from this moment how the remainder will unfold. Let the love in. No point dwelling on the past, as it is history. Let it go. Move on. These points are all oldies but goodies, and definitely themes that would re-emerge throughout the day. At least, as far as I remember. Zoomed in on the elite section before the start. You see, we started rather early. I went to the show with LeLa and her mom, who is a huge fan. Our tickets were supposedly from 8 am to 2:30 pm; having flown in especially for this from Alberta, LeLa’s mom was simply beside herself with excitement, like a normal kid on Christmas morning. They were in line for the general admission seats by 6:15 am, bless them, where I joined them around 7, not too long before the doors at the Metro Toronto Convention Centre opened to the brightly-dressed and stylish masses. We ended up with seats about a third of the way from the front, which was to say, quite a ways back from the stage, given that there were 8,500 people in attendance. Not exactly the ideal venue, but once the show started, shortly after 9 am, the 99% estrogen-fueled crowd forgave the queen bee and her peeps, and enjoyed the gratitude-inspired, emotionally charged day. Jessica Holmes doing her best Celine. The morning portion of the program was not televised, and was beautifully mc’d by Jessica Holmes, of Air Farce fame. She had us all forgetting about the venue in no time, with that great uniter of all Canadians: making fun of Celine Dion. Classic! This girl has pipes, and can beat her chest with her fist like a champ. She introduced the speakers in turn, who each delivered their own gospel for about half an hour or so to an enraptured audience. Actually, we were nodding off a bit during Deepak‘s opener, many of us having skipped breakfast and our daily caffeine injections to be there at the crack of dawn. The man is undisputedly highly intelligent, but a little too evolved and soft-spoken for us at that hour. I think the gist of his speech had to do with awareness consciousness, the central theme of his new book, but I must admit, I was struggling to maintain my consciousness at all. 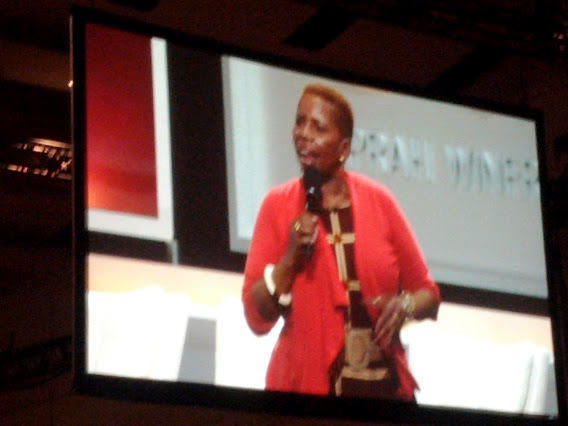 A smarter opener would have been Iyanla, who reminded me of a younger, feistier version of Maya Angelou, full of wisdom and sensible stories. She had us all laughing in no time – a very energetic speaker in fabulous heels, pacing across the stage and mopping her brow under the bright lights, as she repeated her message clearly amongst her many personal anecdotes to drive it home: tell the truth to yourself about yourself, no matter how ugly it may be. You need to hear it. Hmm… All I can hear at the moment is my stomach grumbling, but I’ll take that under advisement. If only it truly were food for thought! The Bishop T.D. Jakes was up next. I personally was not familiar with him, but liked him instantly. Having survived raising a brood of children with the same women by his side for 30-odd years, he has earned his stripes and spoke to us like the elder he is, imparting wisdom in an aw shucks kind of manner. 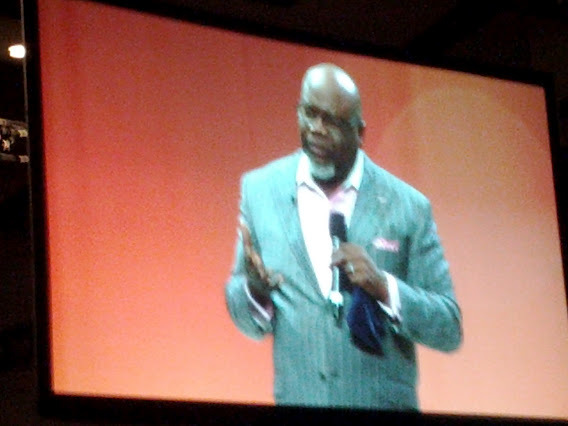 Something about him kept reminding me of Will’s uncle Phil from The Fresh Prince of Bel-Air. His message involved looking at your station in life and the people you surround yourself with. Do you want to be a chicken, poking around in the yard, occasionally eating poo and never being able to fly, or do you want to spread your wings and soar like an eagle, incidentally mating in flight, and only with other eagles? This choir is converted. Baby, we’re here to soar! Finally, Anthony Robbins was up. The man is all about the high energy, participatory style of public speaking, and managed to get all 8,500 of us out of chairs, jumping around, and yelling Yes! at the top of our lungs. Impressive. He also loves to ask questions, and just about every sentence out of his mouth was looking for a vocal affirmation as to how many people could relate, to say I (or should that be O!). Naturally, we all obliged. Repeatedly. I have to say, I really liked his no nonsense approach. It is obvious why his personal power seminars are so successful. I am your Queen. No need to bow, though. At this point, it was shortly after 12 noon, and we were briefed on the rules for the televised portion of the day, the most important instruction being to stay in our seats. It was about then that she surfaced, with her four apostles. Oprah. The crowd, understandably, was beside themselves. Their queen had arrived, and the show got underway. Two men - in a row! I gotta sit down for this. It was just like being in the studio audience, with the main difference being that, during the commercial breaks, she spoke to some people in the crowd, including hugging two girls she ‘had raised for the past nine years’. She also took her stage and microphone cues, and changed her shoes – or rather, she had people do that for her. I mean, after all, she is the Oprah. She did her best to keep it real, and is clearly a pro at retrieving the golden tidbits from her panel of experts, who revere her almost as much as the crowd. The love and support in the room was teeming, and the touching segments moved everyone to tears at some point during the afternoon. She had flown in a few special cases for the occasion, to give it that extra personal touch and authenticity. All in all, we were not disappointed. While this ‘life class’ focused on the theme of Gratitude, it was also a lesson in sound bites, and there were a lot of really good ones. This is precisely what Twitter was made for; in fact, free wifi was provided, along with the cutesy hash tag #OinTO. My personal fave was one about Oprah being the Bieber of middle-aged women, as she was practically molested for hugs and high fives when she graciously floated through the crowds, all the way to the back and up again. I mean, her feet don’t actually touch the ground, do they? Pain = pay attention inward now. Gratitude is the antidote to fear and anger. Reconnect to the divine. Gratitude acknowledges you’ve been given a gift; feel this rather than entitlement. Appreciation is duplication. (Interpretation: Gratitude leads to happiness, which is contagious and comes back to you). Open the door to awareness consciousness. Life happens not to me, but for me. Change your belief system (and your mindset to look for the opportunity in everything). People are like scaffolding. Sometimes they are only in your life to help build you up. Gratitude is a state of being. Change your expectation for appreciation and the world changes instantly. The best things you can give to children are: Attention, appreciation, and affection. Inner sight is more important than outer sight. Your new mantra should be: I am the universe – believe in your infinite potential. All other beliefs are false. My biggest practical take away, though, was to start a Gratitude journal. The idea is that every single day, you write in it 5 things that you are grateful for that day. Lady Gaga apparently did this, based on Oprah’s advice in a show that her Mom saw, back in the nineties. Obviously, it worked for The Monster, so who am I to argue? In any event, I kept waiting for this gem to come up, but it never did: Gratitude is the new Attitude. An apt summary, if I do say so myself. 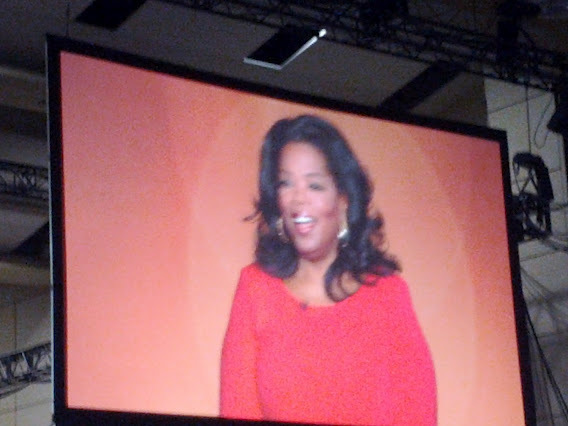 While I haven’t watched Oprah on a regular basis since my school days, after today, I must admit, she’s still got it. I feel inspired, humbled, and, of course, grateful. The sisterhood is just that wee bit stronger after today. This entry was posted in Karma and tagged April, Bishop T.D. 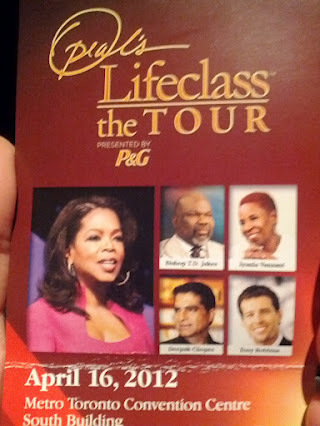 Jakes, Deepak Chopra, Iyanla Vanzant, karma, life class, Lifeclass the Tour, Oprah Winfrey, Tony Robbins, Toronto, Tour. Bookmark the permalink. 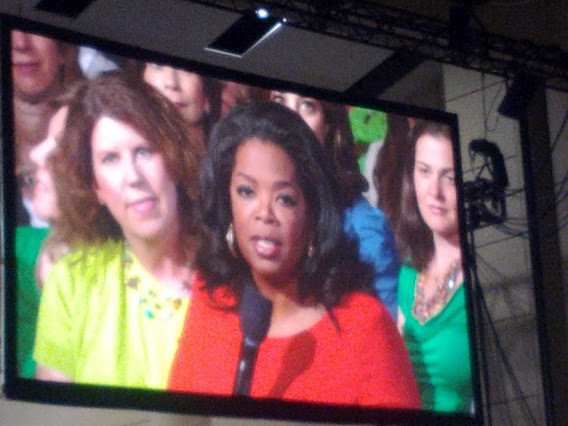 3 Responses to Day 47: Go See Oprah! Hi there! Would love to correspond with you! 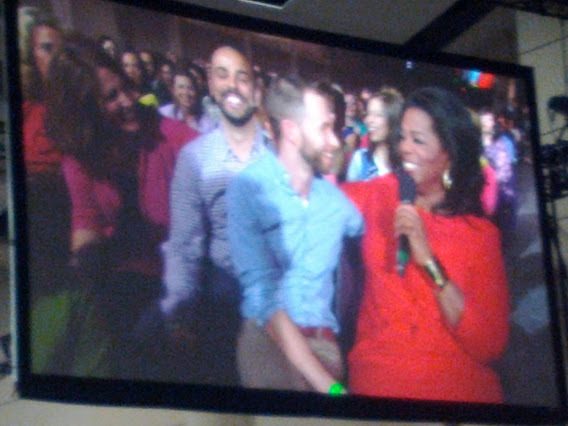 My partner and I are the two gentlemen laughing with Oprah in your picture that you have above! Would you have anymore?! It was such a great moment for us and are looking for as many images of that experience as we can. Can you help us? Thanks so much! Hello! Wow, what an amazing experience for the two of you to have shared! I took a look, and the photos above are the only ones I still have from that day, other than a couple of blurry ones when Oprah took a walk through the crazy crowd. Good luck with your search, and congrats again on the chance to have had the queen of all media literally in your laps. 🙂 Cheers to gratitude!